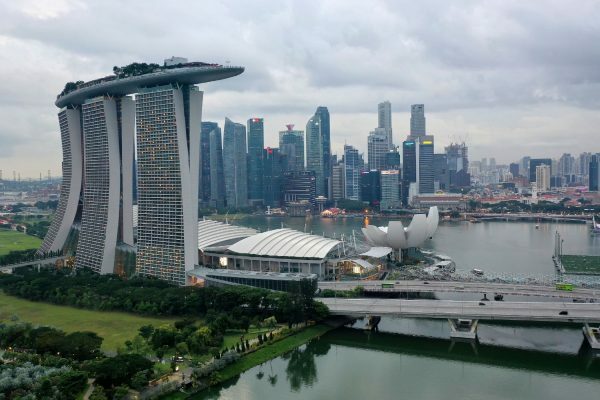 Singapore, the “Lion City” built in modern architectures is one of the top cities in Asia. It’s a city that not only boasts of its least-corrupt governments and a business-friendly economy. It also has a thriving art scene and vibrant tourists attractions. An excellent transportation system and English speaking culture make Singapore the most conducive place anyone wants to be. This island city-state is full of lovely places and sites. You can enjoy shopping from world-class brands and visiting religious, sacred and historical sites. Its luxury hotels and fine dining provide the peak of merrymaking thus becoming the ultimate hub for this 2018 Christmas holiday. 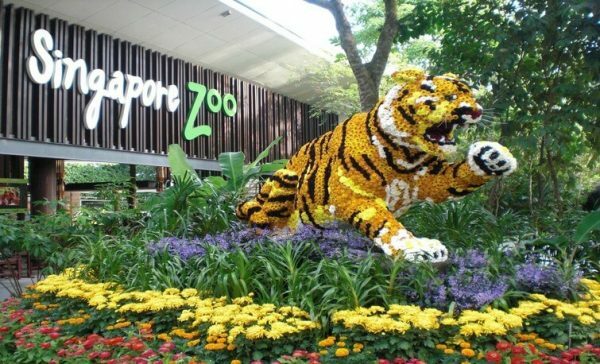 Here is a list of the best attractions in Singapore that you should visit this Christmas. This UNESCO’s world heritage site treasures an endemic exotic flora species. It is a favorite site for nature lovers. Inside this garden, you find the Orchid, a natural flower which is the star attraction here. The Botanic garden has several lakes that harbor ducks and swans. This place portrays the beauty of mother nature and provides a soothing ambiance from the sounds of birds, trees, winds, and swans. This place is a perfect escape from the bursting city. Amidst the wonders of nature, other developments and entertainment events enrich visitors with recreational and educational facilities. It’s the most famous botanic gardens in the world and is worth your consideration. You will find the S.E.A Aquarium on Sentosa Island, and it is the biggest aquarium in the world. It is an exciting attraction for both foreign and local tourists. The aquarium harbors over 100,000 marine species which include sharks, stingrays, turtles, and coral reefs. Besides the exotic marine life, there are other attractions. If you are a fan of dolphins, you can engage them and also interact with sharks and other predators. 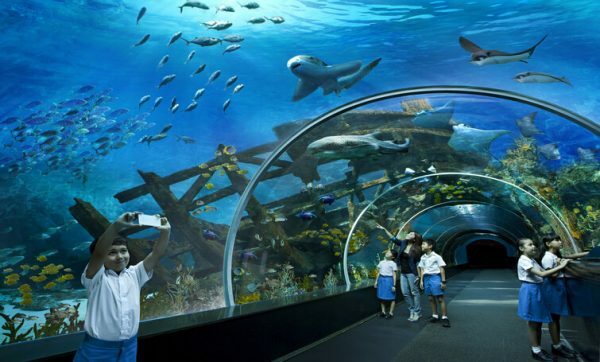 This S.E.A Aquarium will offer you an extraordinary experience here in Singapore. You will learn a lot about marine ecosystem by watching a multitude of marine grouped into different zones. For a more thrilling experience, walk about to Shark seas habitat and see over 200 of these predators. A significant attraction of S.E.A Aquarium is the open ocean habitat where you feel like you are in an ocean cave. In the open ocean habitat, people enjoy sitting and staring at the ocean scenery beyond the glass panels. It is a fantastic exploration of the underwater realms that you shouldn’t miss visiting. Are you fascinated by greenery scenes? If so, then you need to step into this world of perpetual greenery with a display of various exotic flowers. 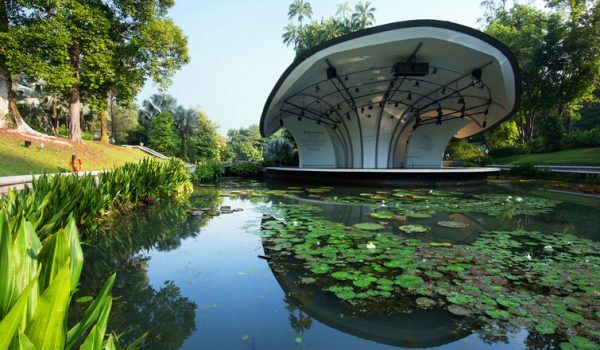 It is a revelation of an innovative design which attracts many tourists to Singapore. 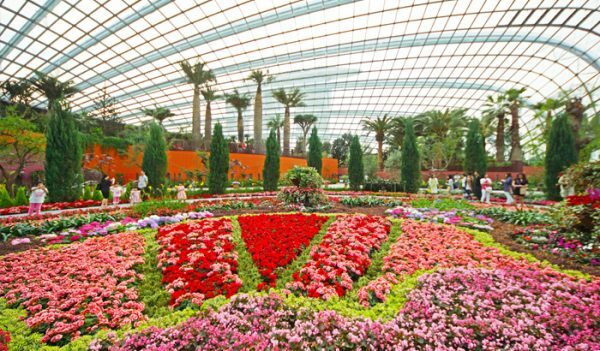 Inside the flower dome is a fresh breeze of the Mediterranean climate. It is a collection of flowers from various parts of the world and includes South Africa, Australia, and the Mediterranean basin. The flower dome features seven types of gardens and an olive grove. The grove has a central changing display unit to allow conduction of flower shows within the conservatory. You will find other plants like the baobab here. The baobab is the largest tree in the dome and weighs over 32 tons. At night, the flower-dome subdue in glittering lights which give it a thrilling attraction. It is at this time the freshness, and the greenery of the dome is most conspicuous. Singapore zoo is an ‘open concept’ zoo where world animals are live in a landscaped enclosures rather than traditional cages. It is 28 hectares in size and holds over 4,000 animals. It is a clean habitat with plenty of lush vegetation. You will raise eyebrows watching Orangutans adults and babies alike swing from one spot to another. You will enjoy seeing large chimpanzee family, kangaroos, a Komodo dragon, zebras, meerkats, and other animals. The zoo is divided into different zones as per animals’ habitat. Thus you will find polar bears and raccoon dogs in a tundra. You will discover beetles and flying foxes in a rich rainforest. You will freeze to see Lion-tailed Macaques and Java Langurs at the Primate Kingdom. With three hours around the zoo, you will enjoy a lot including observing feedings of some animals. There is also the River Safari, Night Safari and Jurong bird park to top your wildlife visit. Plan to have a personal wildlife experience by having a Zoo breakfast with the Orangutans. Singapore zoo is such a great way to make your holiday. 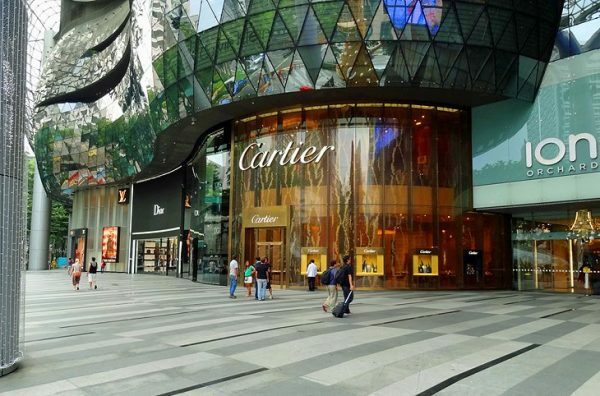 Orchard road is the most famous shopping paradise for many tourists who visit Singapore. It comprises multiple stores packed with the latest fashions. It is the best place to have a shopping spree among the 22 malls and six departmental stores. You will find big shopping labels like Prada, Louis Vuitton, Chanel, Gucci, and Giorgio Armani. With all these, it’s hard to traverse through without a stop to shop. One captivating spot here is Paragon, a shopping complex standing on a glass architectural style. Here you find all sorts of activities and includes medical suites. You will not only see the shopping stores here but also four movie theatres. Therefore, you can relax to watch a movie in an IMAX or a KTV karaoke. It is a site that is all-inclusive as there are several eateries in the neighborhood where you can have international cuisines. 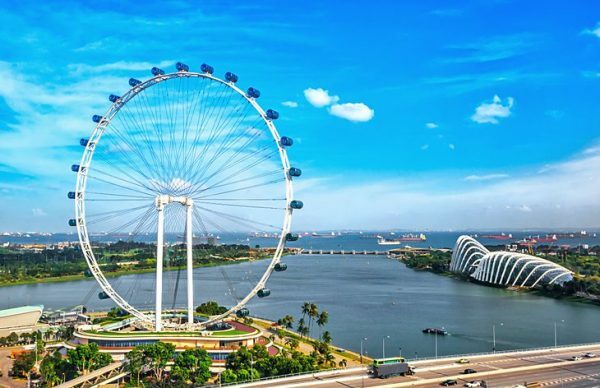 One of the world giant 42-storey observation wheel rates high to a mix of tourists. The flyer provides a breathtaking 360-degree view of the city. It has 28 air-conditioned, UV-protected capsules in which you enjoy a panoramic view of Marina bay sands and beyond. You take tea while having a bird’s eye view of the city and parts of neighboring countries. There are several packages available that allow you to be served and pampered at this site. Each package includes a multimedia showcase that reveals the technology behind the wheel and insights into Singapore evolution. Singapore is, therefore, the best destination where you get a mix of various tastes of world phenomenon. If you are making considerations for the best place to be this Christmas, Singapore should be your choice. It is full of amazing experiences.